Is it even possible to block Google DNS on 850L B1? Re: Is it even possible to block Google DNS on 850L B1? Try setting a static route. Let us know if this works. Go in to your router Features > Static Route. Click Add Route. Repeat with 8.8.4.4, 208.67.222.222 and 209.244.0.3. Actually I already tried using static route method before it came to asking for help here. There is a site stating that the if the interface is locked to WAN it will not work. Unfortunately this router can't set the interface to LAN. Create 3 more rules with 8.8.4.4, 208.67.222.222 and 209.244.0.3. You may not get prompted to reboot. Mine didn't and it worked. After you click Save, the button should be grayed-out unless you make a change. I am using a different model router though but has same GUI. I will see if a tech has an 850L rev B to test. Also, you are blocking the IP address, not the port. The 850L GUI is the same as what I am using. I entered the values exactly like you did except IP address and Port Range. I put my CC's IP address (reserved it too) and 1-65535 as port range because I can't leave it empty. My CC is still using Google DNS. So you do not have a drop-down next to protocol & port range that gives you TCP, UDP, or ANY? Also, create a second rule blocking 8.8.4.4.
hmm strange. That should work. Just to test, edit the 8.8.8.8 rule and put in 192.168.0.1-192.168.0.254 as the source range. Apply. 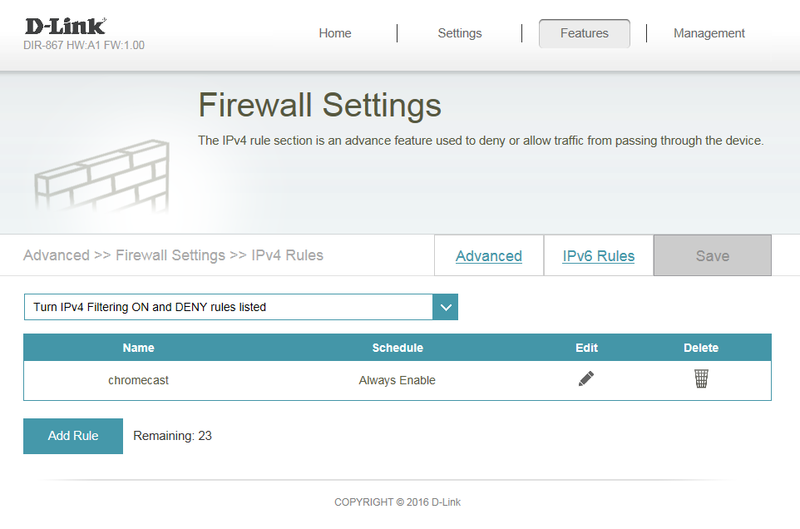 Make sure Turn IPv4 filtering is ON and DENY.... is selected. Click save. Should take like 5 seconds and then ping 8.8.8.8 from your computer and see if you get replies. What firmware are you using and what brower? I used IE 11. You may want to update the firmware. The latest global release is 2.21. Maybe try that and see if it fixes it. 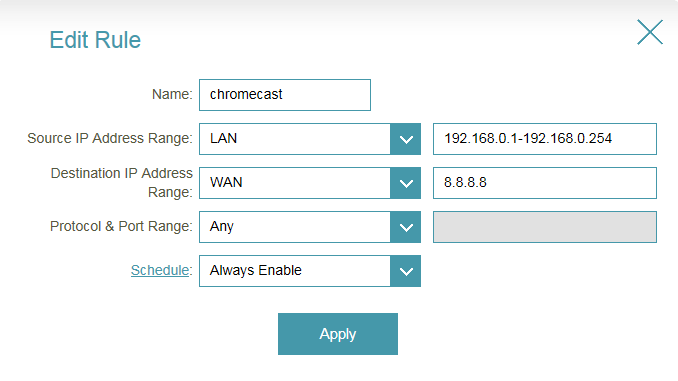 I do not know if the world wide (WW) firmware will work with your router. 2.21 is on the US site as well as tsd.dlink.com.tw (global releases). You may want to contact tech support and report the issue and see if using the 2.21 firmware will work. Your rules are set up properly but looks like the router is not blocking the traffic. Lol I'm afraid to update to this WW firmware. It might broke the router altogether. Anyway thanks for the support. Sorry that didn't work for you. Definitely contact tech support because your settings are correct. This firmware is a 2 step process. The first firmware encrypts the firmware so you will not be able to downgrade if it doesn't work. (you will have to do an emergency firmware recovery to go back to 2.09) so I do understand your hesitation.